Forget Sam-I-Am & Friends, This Girl is Picky! As far as picky eaters go, my daughter Eloise may rank as one of the worst. Possibly traumatized by a horrible case of infant’s acid reflux, she refused to swallow even a spoonful of baby food until she was 10 months old. Even then, she only averaged half a container a day and quit eating it all together by the time she was 14 months old. It seemed Eloise had an objection to moisture of any kind in her food. She existed solely on Gerber Puffs, Cheerios, Annie’s Cheddar Bunnies and freeze-dried fruits. Her pediatrician had a very relaxed take on the problem – time and patience. I was short on both, expecting our second daughter by the time Eloise was 15 months. And I was paranoid about the effect this limited diet – supplemented by formula bottles – would have on her development. Would her growth be stunted? Would she eat this way forever? It was about this time that I discovered “The Seven Silly Eaters,” a book with an all-too-familiar storyline. Mrs. Peters, a true earth-mother type, has a brood of seven, each of whom limits his or her diet to just one unique meal, prepared according to very particular demands. Peter wants only warm milk – not hot, not cold. Lucy demands homemade pink lemonade. Jack sticks to applesauce, while Mac prefers oatmeal, but hold the lumps – or else. Mary Lou eats soft and squishy bread by the loaf, and twins Flo and Fran take eggs – poached for one and fried for the other. Mrs. Peters lovingly indulges her children, but as the years pass and their appetites (not palates) grow, her patience and endurance wanes. 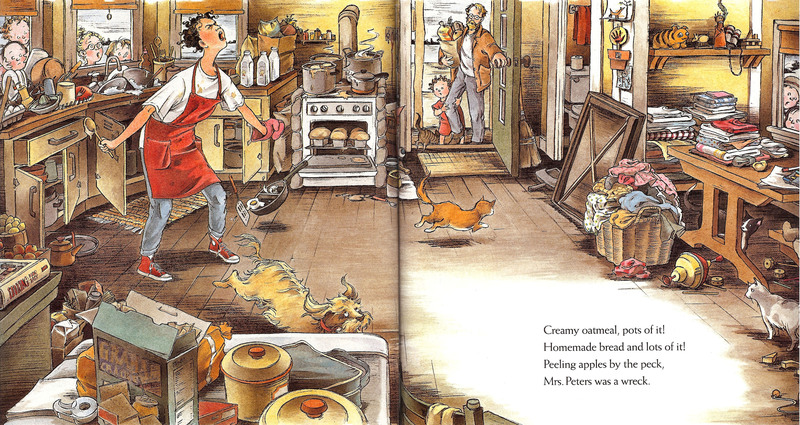 Now this was a mother I could relate to … kitchen a disaster, laundry never finished, pets and children fleeing her exasperated outbursts. I can only assume author Mary Ann Hoberman wrote from experience. She is herself a mother of four, three of whom were born within a span of three years. First and foremost a poet, Hoberman tells her story with perfectly rhyming patterns that sing along in the fashion of “The Cat in the Hat” but without all the nonsensical words. It comes as no surprise that she’s served the past two years as Children’s Poet Laureate. Marla Frazee’s highly detailed illustrations, done classically in transparent drawing inks, tell whole stories in and of themselves. On the title page, we see Mr. and Mrs. Peters standing admiringly before their lakeside house – he with tools in hand and she with a paint bucket and very pregnant – leading one to believe they’ve built the homestead themselves. We watch the number of pets multiply from one to five and their collection of books, scattered throughout the house, grow with each passing year. We see Mrs. Peters’ beloved cello sitting idly in the corner, too many demands placed upon her by her children to leave any time for practice. We watch their neat and tidy household transform into a chaotic mess, toys always underfoot and children’s crafts slowly covering every available wall surface. Both story and illustrations paint a happy ending, though. In the wee hours of the morning of their mother’s birthday, the children sneak out of bed to cook her a breakfast of their favorite foods. Each fails to achieve the same perfection with which their mother prepares the dishes and they give up in frustration, their failed creations thrown into a pot and hidden in the oven. Much to their surprise, and even more so to their mother’s, the still-warm oven bakes the disaster into a delicious pink birthday cake that pleases them all. Made from their secret recipe. They all take turns in mixing it. They all take turns in fixing it. It’s Mrs. Peters’ birthday cake! It turns out there’s an actual recipe for Mrs. Peters’ birthday cake. 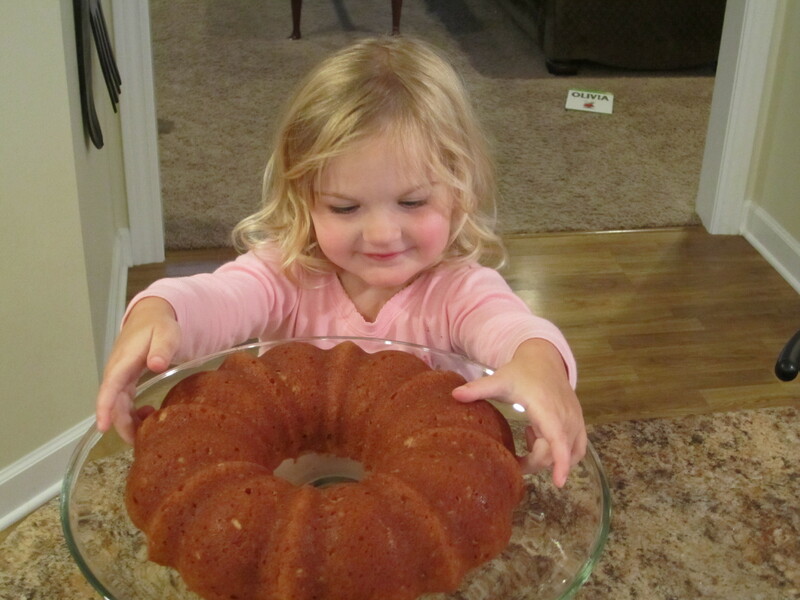 Making sure to incorporate all of the Peters kids’ favorite foods, Hoberman experimented with the recipe in the years after the book’s publication and ended up with something akin to an apple pound cake. As it turns out, both of my picky eaters loved it, so maybe there’s hope for us yet!